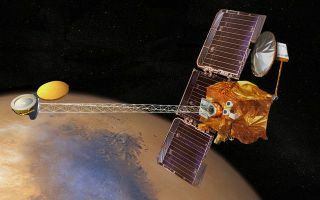 NASA's veteran Mars Odyssey spacecraft orbiting the Red Planet is out of the woods after a glitch stalled the probe's science operations earlier this month. The 11 year-old orbiter went into protective safe mode on June 8 after its onboard computer detected a problem with one of the three reaction wheels that control its orientation. One of these wheels jammed temporarily, so mission controllers instructed Mars Odyssey to use a spare it had onboard. Mars Odyssey uses a trio of spinning reaction wheels to maintain its orientation in space without the use of thrusters, which consume precious thruster fuel. Until recent tests this week, the spare wheel on Mars Odyssey had not turned since before the spacecraft launched toward the Red Planet in 2001. A shakeout of the wheel spun it up to 5,000 rotations per minute, mission managers said. With the spare wheel up and running, Mars Odyssey has succesfully shifted out of safe mode (which pointed the spacecraft at Earth for better communications) to its normal downward direction facing Mars, called nadir. "Attitude control in nadir pointing is being maintained with the use of the replacement wheel, and the suspect wheel has been taken out of use," Odyssey project manager Gaylon McSmith of NASA's Jet Propulsion Laboratory in Pasadena, Calif., said in a statement. "Remaining steps toward resuming all normal spacecraft activities will probably be completed by next week," officials said in the statement. Mars Odyssey launched in April 2001 and has been orbiting the planet for more than a decade, longer than any other Mars mission in history. The orbiter has been mapping the surface of Mars to study its chemical and mineral distribution, and it also serves as a relay station to pass on data collected by landers on the planet back to Earth. Mars Odyssey is a primary relay station for NASA's Mars Exploration Rover Opportunity, and will also serve the Mars Science Lab rover Curiosity after it lands on the Red Planet in August.